January is always a time for us to reflect on the year gone by, and determine what we want to achieve in the year to come. I hope and pray that you have this same mindset when it comes to disciple making. Don’t forget about our Great Commission as you are looking at your personal mission and goals for the upcoming year. The very definition of the word journey (moving from one destination to another) implies that it takes intentional effort and actions to stay on the right path and moving forward toward a destination. Moving towards becoming a mature disciple of Christ cannot happen accidentally, or without purpose. If it could Jesus would not have spent 3 years creating an example of disciple making for his future disciples to follow. Our salvation comes without any work on our part, but our growth as a disciple and disciple maker does require some effort on our part. We need to be like Paul in Philippians 3:14 and “press on toward the goal to win the prize for which God has called me heavenward in Christ Jesus”. That is where some intentional goal setting comes in. When we set new goals, we also need to establish new habits into our lives. Without making a change to our actions and our intent, we have not set goals, we have just identified wishes. Every new habit we set begins in the mind before it ever becomes an action. At some point of repetition a new habit become a consistent pattern in your day to day life. According to the European Journal of Social Psychology, it takes more than 2 months before a new behavior becomes automatic — 66 days to be exact. With all of this in mind – I want to challenge you to set some goals for 2019 when it comes to discipleship. Take a look at 2018 and determine what you did well as a disciple maker, and what you could improve on. Once you come up with one or two areas you would like to grow in, think about a habit you could establish in this next year that would move you further down the road towards your goal. I am listing below 6 of the things I believe are essential qualities of an effective, growing, disciple of Jesus. These are habits or actions that are the results of a mind and life being transformed by and on mission withChrist. No matter where we are on our discipleship journey – these six traits represent the mindset, habits, and goals we should be pressing on towards. Maintain a relationship with Jesus Christ that transforms the way we live in the church, our home, and our community. This is the foundation for every disciple and disciple maker. We must have an abiding, daily relationship with Christ in order to have anything to give or share with others. We are called to make disciples of Jesus – unless we are abiding in Him there is a chance we may just end up replicating ourselves in others. We must recognize that we need Jesus and humble ourselves to His authority on a daily basis. Our relationship with him needs to be intimate and close, not superficial. We should apply to our lives the spiritual disciplines of reading His Word and constant prayer. Our lives will then reflect the fruit of abiding in him, and we will become an example to the people we are discipling. Actively seek to share our faith with those who do not know Jesus. You would think this habit wouldn’t even need to be mentioned because it is obvious. Unfortunately, many people look at the lost as potential converts only, not taking into consideration the part they may need to play in their growth and spiritual maturity. We must have the same heart for the lost that Jesus has. This requires an outward focus that continually seeks to understand and to reach the lost not just from within the walls of the church building, but throughout every area of our lives. It means constantly looking for opportunities to share our faith – in our home, with extended family, at our jobs, on the bus, on the plane…and also share our lives with others wherever we go. Our relationship with Jesus should be the natural overflow of sharing who we are, and our desire should be that every person eventually come to a saving relationship with Jesus as we walk beside them in their journey as a disciple. Determine to help every person you are discipling be connected to Jesus in relationship and connected to his body as we consistently worship together weekly. First, we need to recognize the importance of relationship to God, and set a pattern of relationship in our own lives. Then we must encourage others to do the same, and help them get connected into meaningful, Christ-centered relationship with other believers and with their local church. Nature shows us many examples of animals who stray from the pack or the group and become vulnerable to predators. It is no different when it comes to being a believer. Studies show that the attrition rate of leaving the faith is higher in the members who only attend church occasionally. It is hard to continue to do something new if you have no connection to it – when you have relationships you know someone will notice if you are gone for a week. Having said that, as a disciple you need to be sure you are connecting with the body yourself on a weekly basis. But in addition to being there for your own connection needs, you should be looking for those people you are discipling every week too. Falling behind in church attendance is often an early warning sign that a problem exists. And as a disciple maker it is your responsibility to be aware of that. This is addressed in the next habit. If any person you are connected with strays from Christ, you will do your part to be sure they are noticed, valued, and pursued. Take note of people you are in or have been in relationship with that you see straying from Jesus and the body of Christ. If you see someone that seems to be disconnecting, reach out to them and find out what is going on. It may be that they are going through a struggle somewhere in their life and you will have an opportunity to serve them in some way. It may just be that they are not feeling valued, and having someone notice their absence could make all the difference to their frame of mind. Whatever is going on, remind them that we were created to be in relationship with God and with others. It can be hard and humbling to admit we need help, but that humility and transparency is what can help us grow deeper in relationship with each other, and gain deeper maturity in Christ. In John 21:17 Jesus tells Peter “If you love me feed my sheep”. This command applies to us a disciples also – and in order to ‘feed’ or care for His sheep – we need to know where they are. Intentionally equip people to become a disciple of Jesus Christ who are using their gifts and experiences for God’s glory. This is where the caring for and feeding the sheep really enters in. We should be caring for them in a way that enables them to be all they were created and saved to be. Our goal as a disciple maker is to intentionally disciple others towards maturity. This means we will help our people understand right doctrine and be able to pass it on to those they disciple. This also means that they are learning to follow Christ as their Lord. God has given every disciple His Holy Spirit, His Word, and His people, so that we can know and do His will. We intentionally help the people we are discipling learn to feed themselves, then they can learn to feed those they disciple until those reach maturity. Because no two people are the same, each person will need something a little bit different to grow. That is why the relational aspect of discipleship is so important. As we spend time and do life together with those we are discipling we are more in tune with where they are in their spiritual walk. Each person learns in different ways and has different gifting and experiences. Each person needs to learn how to be all God created them to be by using their gifts and experiences for God’s glory, his good, and the good of the body. Always move toward the goal of releasing spiritually mature disciples of Jesus, who will then go on to make disciples of Jesus. Our end goal as a disciple maker will be that we fulfill the command in Ephesians 4:12-13 and equip all God’s people for service and release them to be who God created them to be. We believe that every person is saved for a reason. Our role as disciple makers is to help them figure out what gifts God has given them to use in the church and to help them start to use it effectively. A spiritually mature person is one who has been serving and ministering and is now thinking in terms of reproducing. They recruit people not only to be a part of completing a task but are interested in intentionally helping people grow spiritually in every sphere of their lives. Spiritual parents are characterized by HUMILITY and INTENTIONALITY. They contribute but also allow people to contribute to them. They share the life of a believer with others in relationship and they intentionally help others do the same. 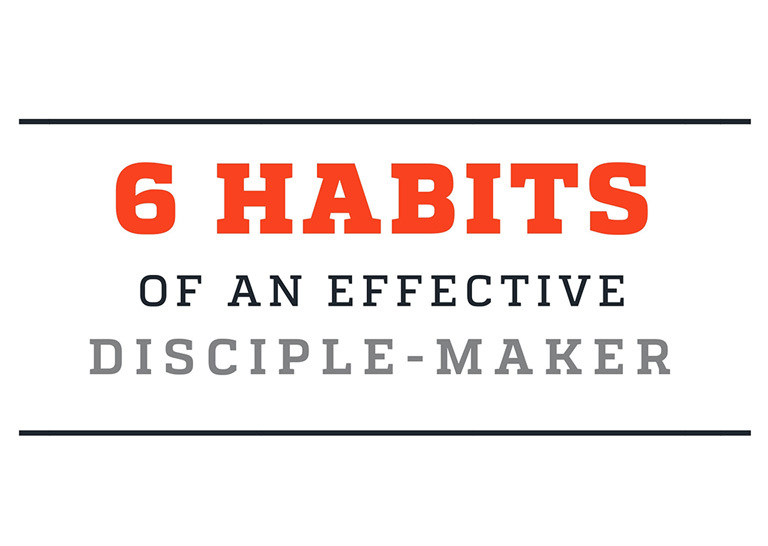 Well, there you have it – 6 habits or attributes of an effective disciple and disciple maker. We like to say discipleship is simple – it is just not easy. Adjusting our lives to fit around God’s mission and values requires an inward heart change by the Holy Spirit that causes us to re-evaluate our thinking about what we value and pursue. We’ve created a graphic of these habits that you can download and put on your desktop or phone wallpaper as a reminder for the year of what you are striving for. You can download it here.